By the time September comes to Prague, the summer tourist season has passed, and with it, the glut of tourists that choke Prague's attractions and fill its restaurants. September offers up a more subdued visit during the last bit of warmth of the season. The approach of autumn in September brings falling temperatures, but it's also sunnier. Moderate temperatures make September a favorite time of year to visit Prague for many travelers – especially those who try to avoid the busiest travel seasons. When you travel to Prague in September, think layers. You'll start off in the morning needing a jacket or warm sweater and by the afternoon you'll be peeling it off. A scarf tied European style is a chic look and adds warmth. A poncho dresses up jeans for the evening and can be layered over a sweater and a blouse underneath for a triple-layer effect. Take jeans or slacks, long-sleeved tops, and lightweight sweaters. Always bring comfortable, flat shoes for walking with good support. Sept. 28th is St. Wenceslas Day. The St. Wenceslas International Festival of Sacred Arts brings sacred music – like chants, choral music, and gospel – to Prague throughout the month of September, but other events surround the holiday celebrating this patron saint. Also look for related events throughout the country. The Prague Autumn Music Festival occurs annually in September. 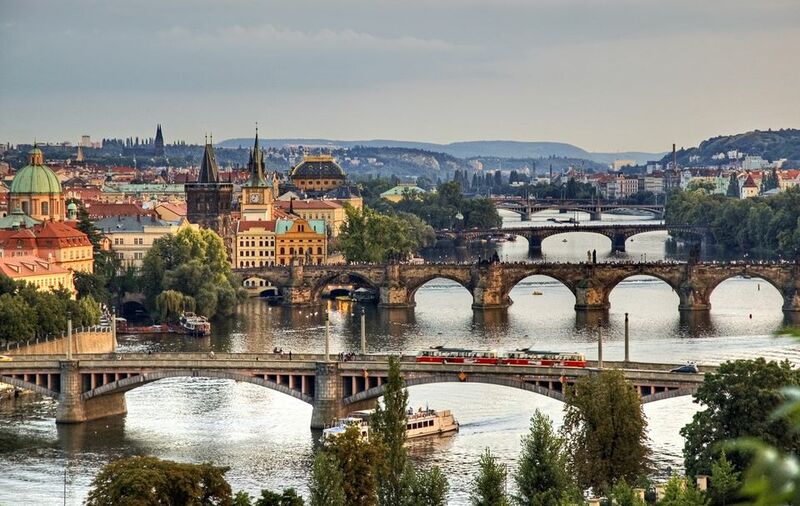 The autumn version of Prague Spring, it's a popular event for travelers to experience. During this month brass band music gets center stage with Vejvoda´s Zbraslav festival. The Rudolfinum plays host to the Dvorak Festival, a special event for classical music fans. Wine harvesting is a big deal in the Czech Republic in September, and Prague's Vinohrady district gets in on the action. Enjoy sampling local wines or participating in wine-related events in Prague or nearby towns and villages. September is a great time to take a day trip from Prague. Visit destinations outside of Prague like Karlstejn Castle or Kutna Hora. Take a tour of Old Town Prague to see the major sights and walk up to Castle Hill for even more attractions and pretty views of the town center below. Take home a bottle of local wine to extend your memories of your trip to Prague and pick up a cookbook of traditional recipes to pair with it. Prague offers many opportunities to get a view of it from above, from the tower on Charles Bridge to the lookout in Old Town Hall. With fewer fellow travelers, you'll have a better opportunity to enjoy these panoramic views than you would in the summer. Lingering bursts of warm days mean that it is still comfortable to eat outside during September, especially at lunchtime. Take any opportunity you get to eat on historic squares or tidy courtyards. Prague's cafes are accompanied by historic reputations -- Cafe Slavia was once a hotspot for intellectuals and political activists. Warm up with a hot beverage or refuel with a soup, sandwich or sweet snack as you imagine the conversations that occurred between those walls. Think of gray or rainy days as great museum days. From museums that expound on individual themes to those that honor the life of important historical figure, it's easy to find out more about the city's past and forget all about the rain.